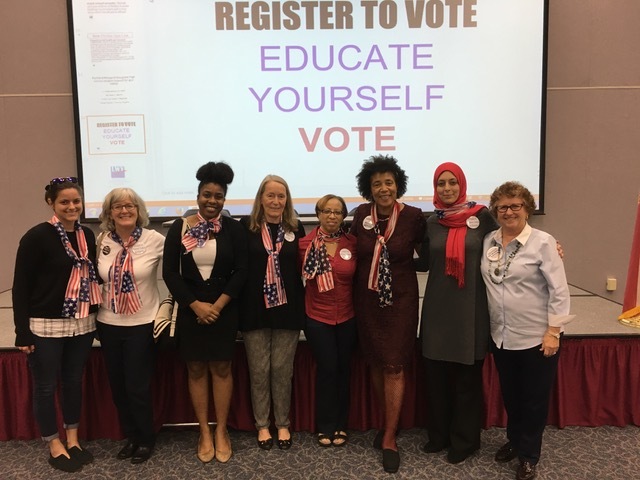 The League of Women Voters, a nonpartisan civic engagement organization, encourages citizens' informed and active participation in government, works to increase understanding of major public policy issues, and influences public policy through education and advocacy. Who is in the League? The league accepts memberships from people 16 years and older. We welcome diversity based on race, religion, gender, party affiliation, economics, education, and sexual preference. Gender identity and other personal choices are not relevant to membership. We are proud to attract committed passionate people who volunteer their time to help increase civic participation and voter participation. Everyone is welcome to visit our meetings to see if they want to join the League. Who are Board of Directors for the League of Bay County? President- Cecile M Scoon, Esq. We meet monthly on the fourth Monday at 6:00 pm at TGI Friday's restaurant on 1022 West 23rd St, Panama City, FL. 32405. Dinner is available on your own.